I’ve learned a lot from doing this, and I’m now confident in opening the sale to everyone! No matter who you are, or where you’re from – You don’t have to be black, white, Chinese, or anything really – you’ll very soon be able to order your copy of The Bed & Breakfast Bootleg Volume 1! The process will be much faster and simpler now and for anything sold here in the future, which is to be explained in a new bootleg sale post, which will be up almost as quickly as you can sing ‘The Liberty of Norton Folgate‘. 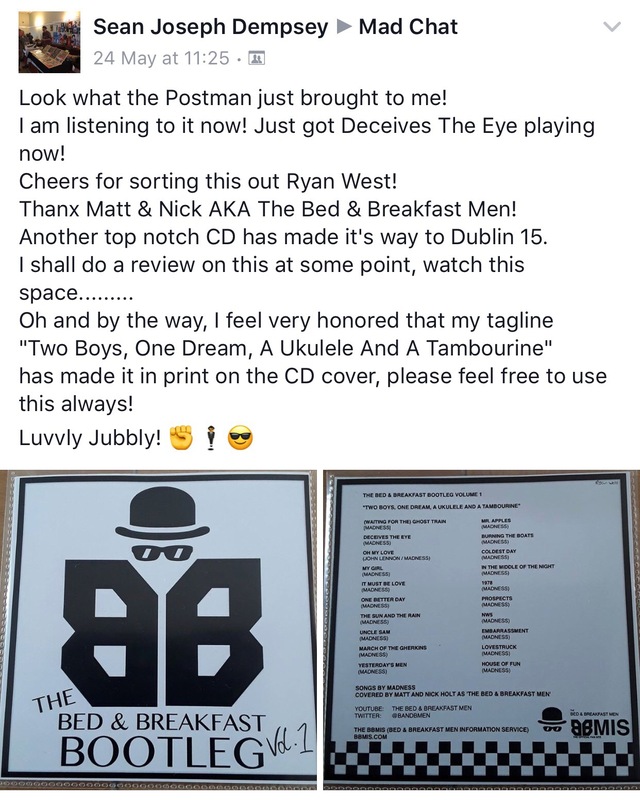 Just wanted to thank everyone who dug deep in their pockets to buy one of Ryan’s excellent “Bootlegs”, great idea for fantastic cause. We’ve got more covers up our sleeves from old, new and obscure so I’m sure we can make it to volume 3 some day. All the best 1/2 B&B. On behalf of Matt, Nick, and myself, thanks again, everyone! Author String WestPosted on June 13, 2017 June 14, 2017 Categories Site updateLeave a comment on Mission Bootleg: Success! Welcome to the Bed & Breakfast Men Information Service. Welcome to the Bed & Breakfast Men Information Service (BBMIS), the official fan site of the best ukulele based, close harmony, ‘Madness’ tribute duo in the whole world. Hello! I’m Ryan, and I’ll be the leader of your new Bed & Breakfast Men fan club, the BBMIS. Here you’ll find all the latest information on the duo, including general news, Q&A’s, fan photos, sneak peeks, and occasional updates from the boys themselves. To kick things off, I’ll be putting together your first BBMIS exclusive Bed & Breakfast Men Q&A, and we’re asking you to submit your questions! Think up a question, can be anything to do with the boys* and their musical journey. You can ask your question for the two of them, or to Matt or Nick individually. Post them here in the comments, (easier with a WordPress account to do so, free and easy to create! ), and I’ll pick some (not sure how, or how many as of yet, but that’ll all be worked out properly for future editions) and send them to the boys to answer. Matt and Nick will each pick a favourite question to answer, too. We look forward to reading your questions, have fun and enjoy the new site!